After logging into Web Hera, the interface will launch in your web browser. The interface and some useful information about it is shown in Figure 1. There are three different sections or windows. The User Account Window, Tool Parameter Window, and Command Window may be resized relative to each other by clicking and dragging their horizontal borders. A window containing a list of available tools may be generated on the left hand side of the interface by clicking on "Tool List". Tools are grouped by subheadings of Ftools and mission-specificity. Files may be uploaded to your Hera account, but directories cannot. Figure 1: The Hera interface. The different window sections are labeled in blue and user interface buttons are labeled in red. Double-clicking on a folder's name will open it. Single-clicking a file name will select it; double-clicking on a file will open its header. The user interface buttons, seen by hovering over the file icon to the left of the file name, provide ways to view a table or header, download, rename, and delete the file. 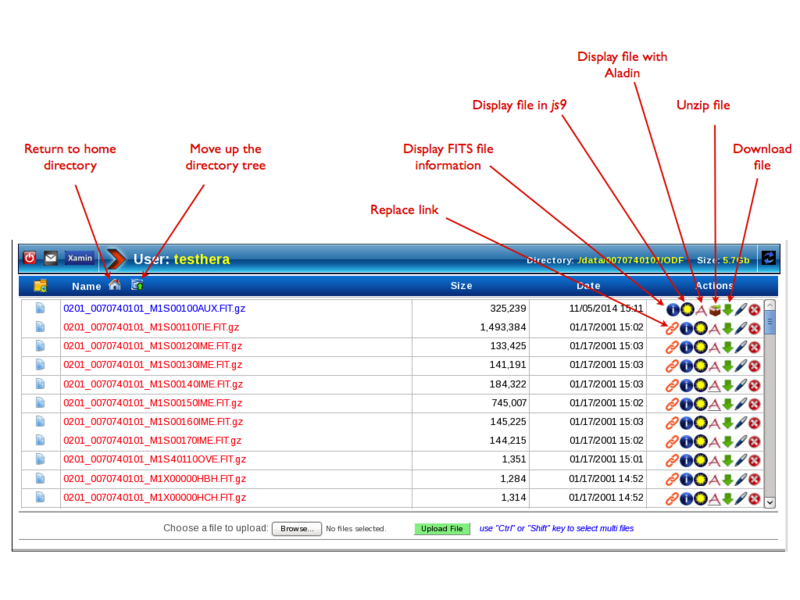 In Figure 2, a file list is shown in the User Account Window. It is likely that the first thing you will want to do is uncompress the data in your ODF directory. To unzip a file, highlight it, hover over the file icon, and select the unzip option. Note that multiple files can be selected at once by highlighting with the shift key (for a continuous block of files) and the control key (for particular files). 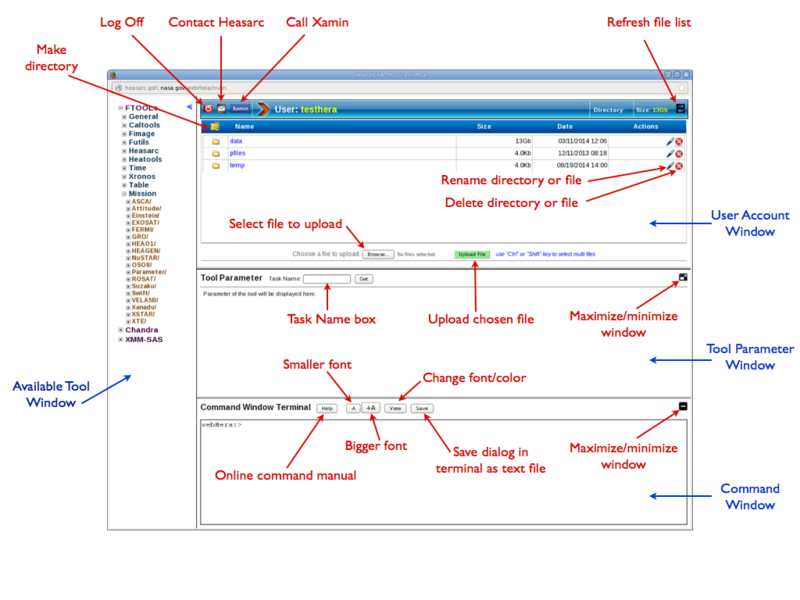 Figure 2: The User Account Window for the Hera interface, with user interface buttons labeled in red. To use the Parameter Window, either toggle on the Tool Window and select a task, or type in the name of the task and click "Get". The task's parameters will be listed in the Parameter Window and you can edit them as needed. To run a task, just click on the "Run (task name)" button at the top or bottom of the Parameter Window. Either way, feedback such as server communications, warnings, and errors will be displayed in the Command Window. As with locally-run SAS, the output from tasks will be placed in the directory in which that task was called. Please note that due to security concerns, plots and images cannot be displayed on the Hera servers. Users must download event files, light curves, images, etc. to their own machines in order to view them.